When she came to our store, it was 4 years ago. 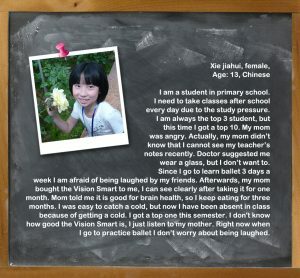 At that time, her vision was almost gone, it means that she couldn’t see much. She was almost blind. She had been treated by ophthalmologist for several years. 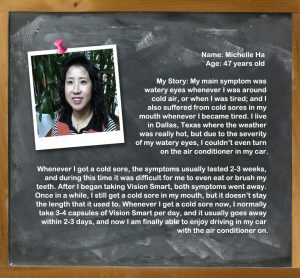 But, her symptom didn’t get improved and also her vision continued to lose. 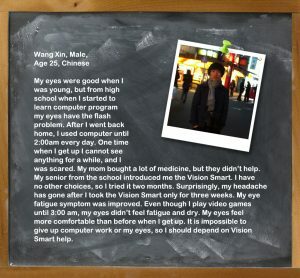 Eye doctor said that her retinopathy was weaker than normal people, so there were no medicine to cure her eyes. Her retinopathy didn’t get any damaged from outside object and also didn’t get any damaged from inside her body. It was naturally weaker than normal persons. Her diets are normal Korean style foods. She doesn’t eat American style diets. She ate meats (beef & pork) 2 – 3 times per week. She didn’t exercise and she is a house keeper. When she came to store, I recommended 3 capsules of VSC. 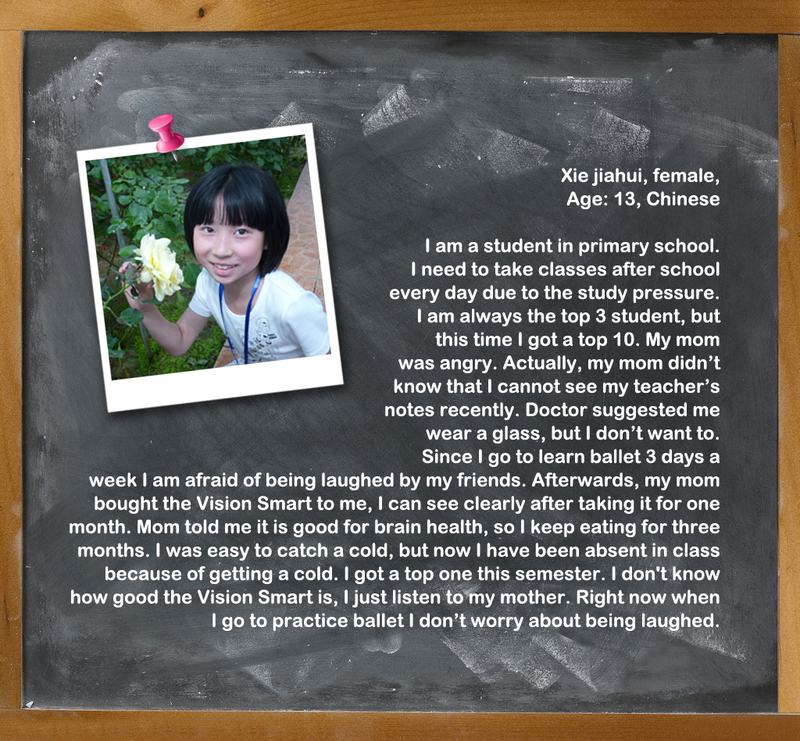 After she took VSC for 6 months, she started to see objects clear than before. When she came to store first time, she couldn’t walk by herself because of her vision. But, after 6 months, she could walked around by herself. She didn’t skipped VSC last four years or little longer period time. July, 2018, small vessels in her eye was popped out. And her vision was getting bad. She went to see her ophthalmologist and he told that blood was covered retina, so she needed to take shot to dry out bloods in retina area. She had shot every month, so she had two times. She will go to see eye doctor next month again. So, I recommended her to take VSC 4 capsules per day until stopping shot from eye doctor. She doesn’t have diabetes and high blood pressures. She doesn’t drink. Her vision is O.K. to walk around. I couldn’t answer about why it happened while she was taking 3 capsules per day for 4 years. All I told her that if she didn’t take VSC, it could be happened much earlier and it could be got more serious. Similar cases were reported to us. 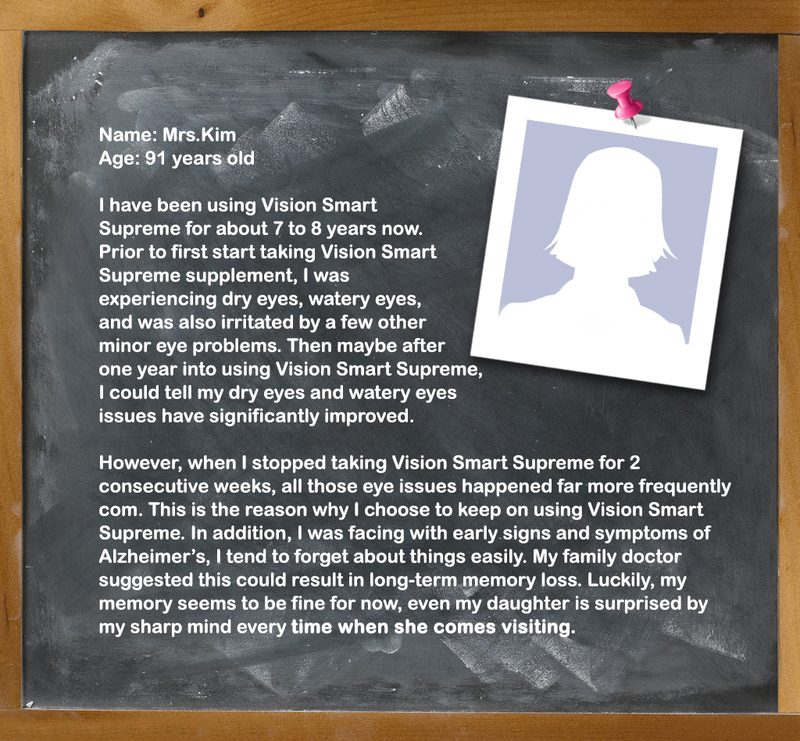 One of customers had almost same problem like Mrs. Lee and eye doctor told her that she will be blind in next 3 – 5 months or later time. At that time, she took VSC, one year later, she went to see eye doctor without any help. It meant that she could see again. She was over 80 years old. When he started to take diabetic medicine, his sugar level was over 250. He has been taking diabetic medicine for 2 years. He drank 1 – 2 times a week or sometimes more. Each time, he drank almost one bottle of soju. He tried to exercise, but he didn’t do regularly. It maybe 1 or 2 times per week. Mainly during the weekend, he walked around his house. After he took diabetic medicine, his sugar level was pretty much normal. But, sometimes, it went up to 200. Because he ate too much meats while he drank. He ate normal Korean style foods at home and work. He ate brown rice and vegetables, but didn’t really control his foods. He had problem to lose his vision. It wasn’t really serious, but he couldn’t read subtitles on TV. When he started to take VSC, I recommended him to take 2 VSC after he drank, even he took one capsule in the morning. After he took VSC for 8 months, his blood sugar level didn’t go up and stayed normal after 3 months later. He wasn’t sure exact time. He started to know that his vision was getting better. Because, he could read subtitles on TV. He told me that he didn’t control his diets, but still blood sugar level is staying normal. But, he is still taking diabetic medicine. She was business woman, her job was to meet lot of peoples. She was very active and energetic woman. She used to play golf for pleasures and businesses. She had been suffering dryness of her eye. It was pretty bad, so she always used eye drop for more than two years. One day, she noticed to have difficulty to see hole cup on the green when she was going to putt. She ignored, but her vision was getting bad. It was not only at green, but while she was driving, too. She had been taking diabetic medicine and supplements for more than 5 years. Her problems were that she didn’t take care of her diabetic symptoms. She didn’t exercise and didn’t control diets. And she didn’t take medicine that doctor asked for. She just took medicine or supplements whenever she remembered. She didn’t know her blood sugar level, because she never checked by herself. Only she did at doctor’s office and she didn’t remember it. Only she knew was that her blood sugar level was much higher than normal. 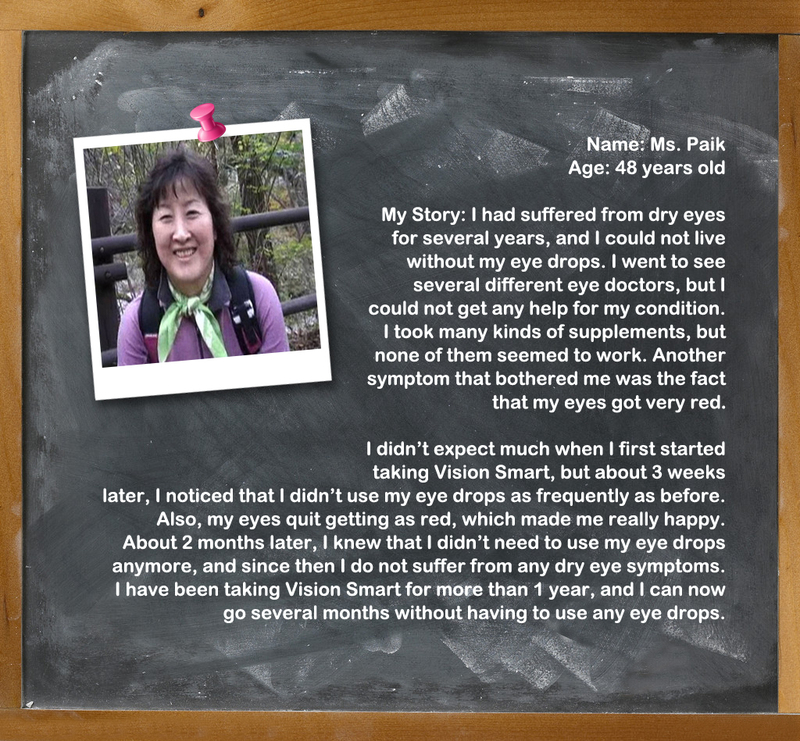 Due to her vision, she went to see eye doctor. It was diagnosed AMD caused by diabetes. And eye doctor told her that she needed to take shot every other week, because her symptom was really serious. She took shots around 2 – 3 months and then she didn’t go. Because she had bad side effects on her eyes after she had a shot. After she had a shot on her eye, her eyes were red and watery all day. It went to next couple of days. Her job was to meet lot of peoples to talk, but after shot, she couldn’t pursue her job because of her eyes. 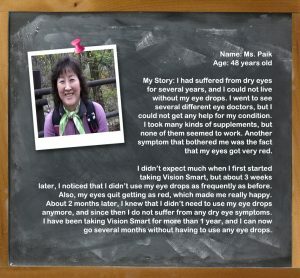 The reason was that she started to take VSC, was dryness of eye. After took VSC for couple of months, dryness of her eye was much better. And then, after few more month later, she found out her vision was better. She could clearly notice her vision was improved. So, she didn’t have any problem to derive and her putting was better, too. While she was taking two capsules of VSC per day, I found she had diabetes. So, I recommended her to take 3 – 4 capsules per day. After that, she started to take 3 or 4 capsules per day. On the other hand, she always worried about quitting to take shot for AMD. So, about one year later after stopped to take shot, she went to see her eye doctor. When eye doctor saw her chart before checking her eye, he yelled at her about losing her vision. Because she didn’t come to take shot for more than a year. After eye doctor checked her eye, his face was changed and he couldn’t believe how it could be happened. After he checked her eyes, he started to ask her “did you get shot at other doctor’s office or did you take any medicines or any supplements for AMD, so on”. She told him that she was taking VSC only. Still, his face didn’t believe that VSC could make improvements. Eye doctor told her that she didn’t need to take shot at that time, and come back next month. After that, she didn’t take shot. At that time, she realized the diabetes caused eye problems. It meant diabetes could be better, if eye problems were gone. So, she went to see her internal medicine doctor to check up her diabetes. Doctor told her to keep blood sugar level as what showed the result. She told me that doctor thought she was taking medicine well. But, she only took VSC. I am worrying about her that she could think VSC to solve all those matters. So, she won’t take care of herself in future time. If the symptom came back again, then she could complain about effectiveness. Doctor gave him warning to control his diets, because he could be get diabetes. He drank 3-4 times or more per week. He had been doing this for last more 15 years.He ate beef or pork 4 – 5 times per week or more. He almost didn’t exercise at all. He played golf once a week. But, he didn’t walk and took cart. No exercise. He had been suffering for his vision. Especially, while he drove the car at night time, it was getting difficult see the road when head light came from opposite direction. 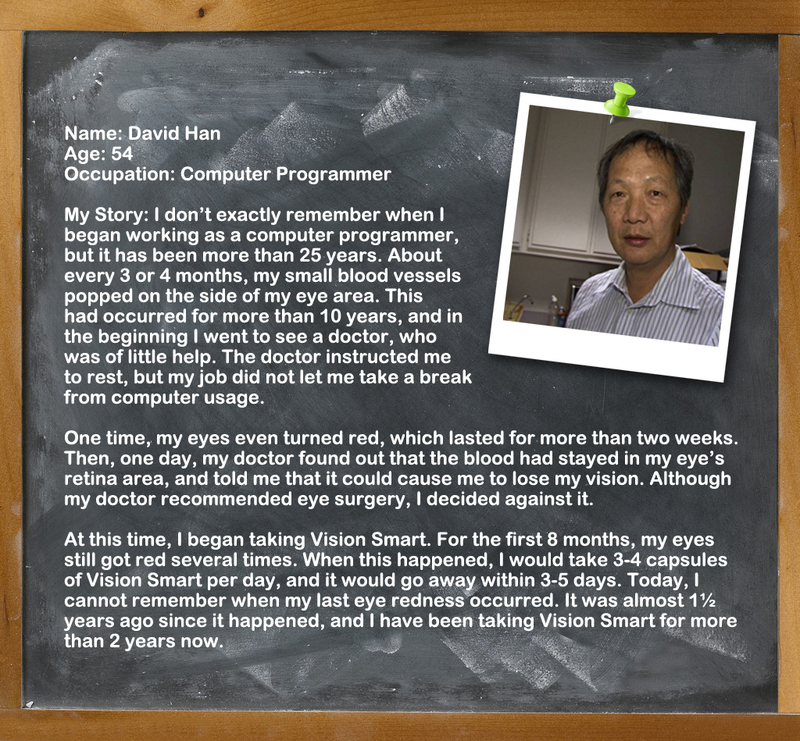 He had taken VSC for 5 months, after that, his vision was really improved. When he played golf, he always couldn’t trace the ball after hit the ball. But, now he can find the place where the ball landed. He had been seeing internal medicine doctor regularly. The doctor gave warning sign about diabetes to him about year ago. When he saw his doctor last time, his doctor told him about his diabetes and his heart. The reason was that his doctor gave him a warning about diabetes, was that his heart was not normal pumping, but not serious. But, if he got diabetes, his heart could be bad, too. That was what doctor warned him. Last doctor’s visitation, his blood sugar level was normal and his heart movement was normal too. I think heart movement was cardiovascular activity. He didn’t stop to drink. 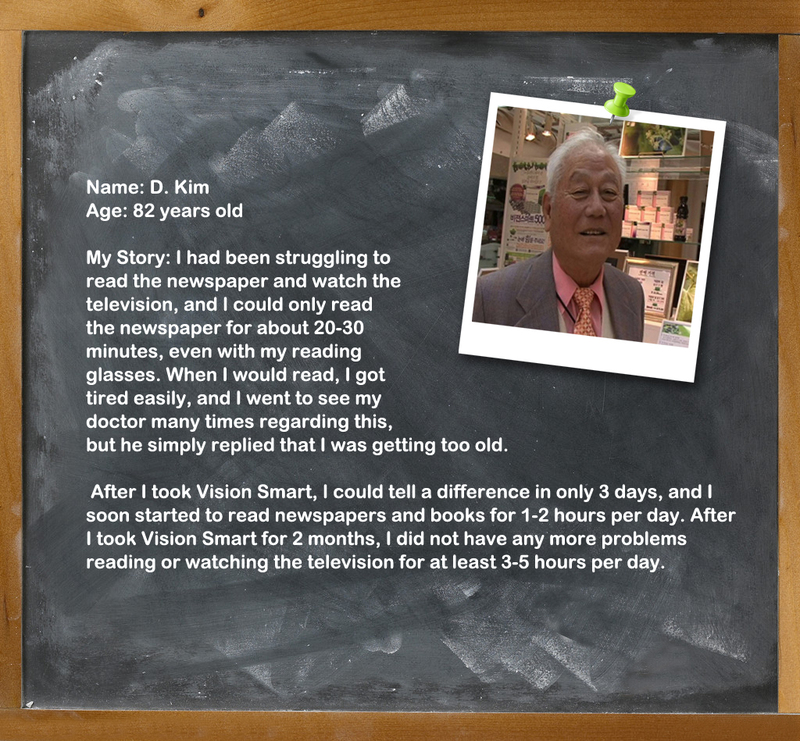 He was happy about improvement of his vision and his cardiovascular system. He ate beef or pork 1 or 2 times per week. The amounts of beef or pork were 2 – 3 pieces each time. Mainly he eat vegetables and brown rice. It seems well control his diets. He exercises every morning and evening about 30 min. to walk. He has been taking diabetic medicine for more than 25 years. And also, he is taking medicines for high blood pressure and heart and cholesterol. He is taking diabetic supplements and other vitamins for years. Diabetic supplement was bitter melon for 2 years. He took different supplements before. 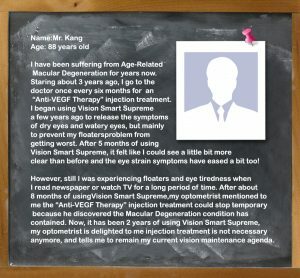 He got diagnosed diabetic retinopathy 3 years ago. At that time, his vision was getting bad. 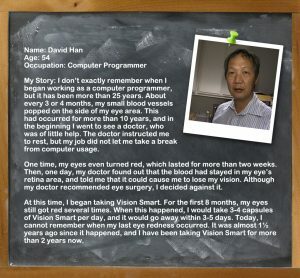 After he heard from eye doctor that he could lose his vision, he really tried to control his diets and did exercises. 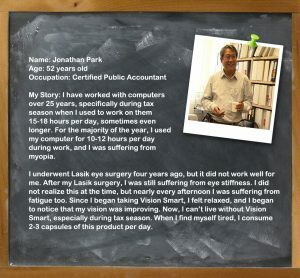 Before hearing diabetic retinopathy from his eye doctor, small blood vessel in his eye used to be popped out. It was irregularly. After he controlled his diets properly, small blood vessel didn’t pop out like before. But, still sometimes, it happened. But, not like before. Meantime, his vision was getting bad, caused by diabetic retinopathy. Under controlling his diets, still blood sugar level is higher than normal. About 5 years ago or before, it showed myodesopsia on and off. Around 3 years ago, it was pretty much same time that he got diagnosed diabetic retinopathy, myodesopsia was getting worse. It showed one or two black spots on eye, and sometimes, it showed 4 or 5 black spots moving around on eye. Myodesopsia made him to have worst daily life. At that time, he started to take VSC for removing myodesopsia. Whoever had diabetes, we always told them about time of effectiveness. It meant that it would take much longer time than normal person. And he took for 8 months, he told us that his vision was getting better. At that time, I recommended for taking 4 capsules of VSC per day with 2 capsules of Zinc Picolinate. Because his blood sugar level was still higher than normal even he had been taking medicine for years. Around that time, I heard that he had diabetic retinopathy, too. I explained him how VSC worked for diabetic retinopathy. But, still he had myodesopsia. It didn’t show 4 – 5 black spots like before, it sometimes showed 1 or 2 black spots. He told me that he felt much better than before. After took 4 capsules of VSC and 2 capsules of Zinc Picolinate for more than 6 months, his blood sugar level was almost normal. The good news was that eye doctor told him that his diabetic retinopathy didn’t go worse. It stayed as 6 months ago. It meant that his symptom was improved. In this case, I need to check his status more time about improving his symptom or staying or getting worse. 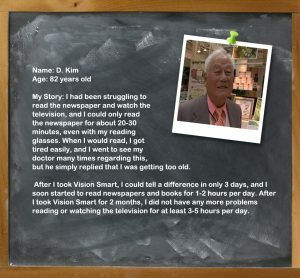 Moon： Early 70 years old，Stroke and losing sight and migraine. She had stroke 2 years ago. Luckily she survived after surgery. She didn’t have diabetes, but she had high blood pressure, so she took medicine and cholesterol medicine, too. After surgery, she was taking blood thinner medicine. She was taking all kinds of blood circulation supplements, too. And blood pressure medicine and cholesterol medicine. After surgery, she started to lose her vision. 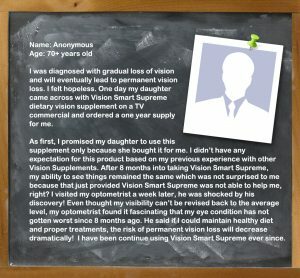 She went to see three different eye doctors, but they said same story that there were not wrong with eyes, no glaucoma, AMA, or any other eye diseases. So, she went to surgeon who did for her stroke about eye problem. He recommended to take MRI for her brain for any tumor existing. But, it came out clean. Still, she was suffering for her vision. She came to store about one year ago. I explained working mechanism of VSC, but I little hesitated about she was taking blood thinner medicine. 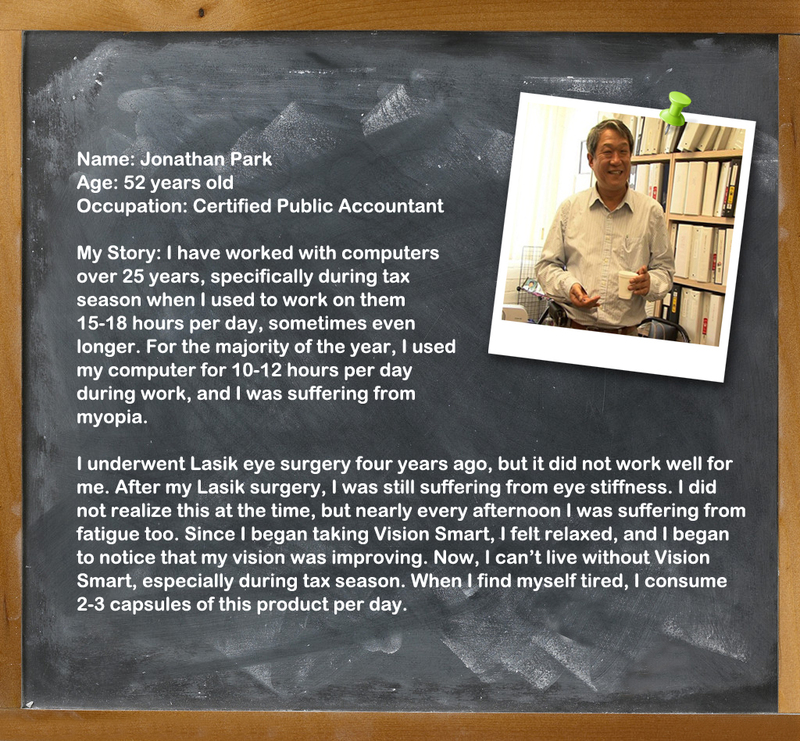 I had similar customers who took VSC while took blood thinner medicine. I recommended her to take 1 VSC per day for 2 months, after that take 2 VSC per day. Do not take more than 2 capsules per day. 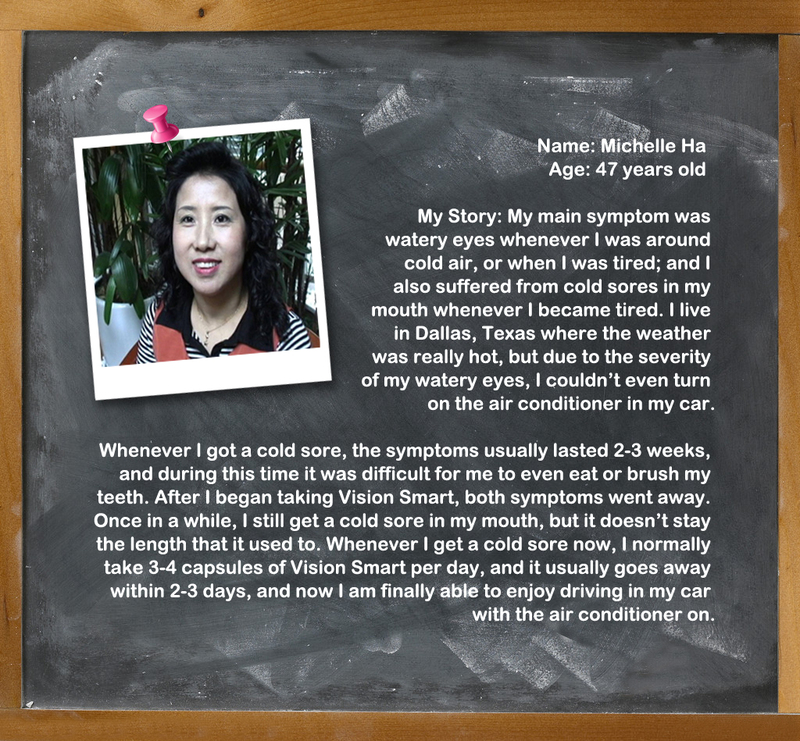 After 8 months later, her vision came back, but not like before. 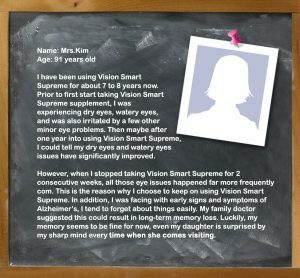 But, she didn’t have any vision problem. After surgery, she openly suffered for migraine. But, she didn’t mentioned migraine at first time. She told me that she didn’t have any migraine any more. She didn’t realize when it was gone, but she said it was gone at least couple months ago. It meant that it was gone after 6 months. I explained her how VSC worked for migraine. He has been taking VSC for last two years. He didn’t take shot to his eye. 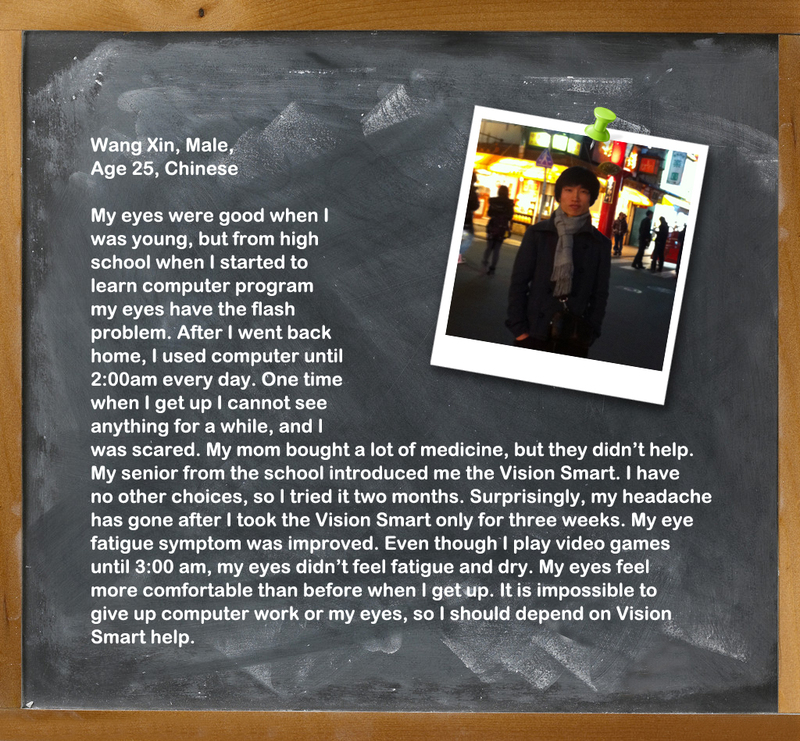 After he started to take VSC, his vision was getting better. His concerning was that his AMD could be stopped or not. Because eye doctor told him that there were no medicine and only tried to stop the processing. If it stopped, then it will be great. This was two years ago story. After two years, symptom of his eye were still same as one year ago. He went doctor’s office every month, but still same. It meant that VSC helped his eye.